Reviewers describe Dr. Saad as a good listener, attentive, a great specialist with a beautiful spacious office who gives her clients the steps needed to begin the process of healing. She is also described as intuitive and supportive and incredibly inspiring. School: Derner Institute for Advanced Studies, Adelphi U. In 2005, Dr. Yasmine Saad obtained her Ph.D. in Clinical Psychology from the Derner Institute of Advanced Psychological Studies - Adelphi University, which is considered the best program for psychodynamic therapy training in the country. Following her graduation, she worked for a year in an outpatient clinic and then for six years at Montefiore Medical Center as an attending psychologist, providing individual, couple, and group therapy and supervising psychologists. 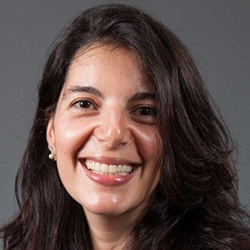 In addition, as an Assistant Professor of Psychiatry and Behavioral Sciences at Albert Einstein College of Medicine, she was actively engaged in teaching and supervising psychiatry residents and psychology trainees. She was sought after for her teaching and supervisory skills and became the clinical supervisor to the psychology staff of Fordham University's counseling center. Success in her practice and teaching led her to build Madison Park Psychological Services, a group practice where psychologists, whom she has trained, provide tailored, high-quality treatment to match the patients' needs. I specialize in depression, anxiety, panic attacks, relationship issues and parenting challenges. I offer individual, couple and family therapy, and will tailor treatment to who you are and what your needs are. I offer cognitive behavioral therapy, dialectical behavioral therapy, psychodynamics therapy, and mindfulness/stress reduction techniques. Reviewers describe Dr. Saad as extremely helpful and enlightening. They rate her highly on her short wait times and praise her as someone who listens and offers hope and understanding. Dr. Yasmine Saad maintains an active private practice in New York City. She believes that the success of any therapy stems from a good match between patient and therapist personalities and between patient and treatment approach. She provides a comfortable, safe and warm environment while using her expertise with various forms of treatment to tailor the therapy to the patient's needs and personality. She focuses on the present and helps you deal with your current issues as they manifest themselves in everyday life. She actively and empathically works with you to understand your difficulties, solve problems and expand your personal growth. She provides individual, couple, and group psychotherapy for adolescents and adults in Spanish, French, and English. Out of Network benefits. Call for details. The reviews posted on Google are overwhelmingly positive. Dr. Saad is described as exceptional, competent, caring and compassionate. She is also described as a nice, well-rounded person and a gifted psychotherapist. Reviewers refer to Dr. Saad as extremely bright, warm, flexible, and someone who truly connects to her patients.